In the winter try to set the thermostat to 68°F while you’re awake and try to set it lower while you’re asleep or away from home. By turning your Thermostat Settings back 10°–15° for 8 hours, you can save about 5%–15% a year on your heating bill—a savings of as much as 1% for each degree if the setback period is eight hours long. The percentage of savings will also depend on the weather conditions of the region you live in. In the summer, you can follow the same strategy with central air conditioning, too, by keeping your house warmer than normal when you are away, and lowering the thermostat settings to 78°F (26°C) only when you are at home and need cooling. Although thermostats can be adjusted manually, programmable thermostats will avoid any discomfort by returning temperatures to normal as you wake or return home. There is a common misconception that that furnaces and air conditioners will need to work harder and use more energy to warm or cool down the space back to a comfortable temperature after the thermostat has been set back, resulting in little or no saving. On the contrary, during the winter, the minute your house drops below normal temperature, it will lose energy to surrounding environment more slowly as the lower the interior temperature, the slower the heat loss. The longer your house remains at the lower temperature, the more energy you save, because your house has lost less energy than it would have at the higher temperature. During the summer period the same concept applies to raising your thermostat setting to a higher temperature which will slow the flow of the heat into the house and result in energy savings. A programmable thermostat offers a lot of flexibility in its temperature settings and avaoid any discomfort of constantly resetting the temperature. The temperature can be adjusted to the specific pre-set schedule and this will turn on and off the heating and air conditioning according to your needs. Your equipment will not operate to the highest capacity while you are away or asleep resulting in energy savings. When choosing a programmable thermostat you need to know that most are either digital, electromechanical, or some mixture of the two. Digital thermostats offer the most features in terms of multiple setback settings, overrides, and adjustments for daylight savings time, but may be difficult for some people to program. Electromechanical systems often involve pegs or sliding bars and are relatively simple to program. When programming your thermostat, consider the time when you go to bed and wake up. If you prefer to sleep at a cooler temperature during the winter, you might want to start the temperature setback a bit ahead of the time you actually go to bed; you probably won’t notice the house cooling off as you prepare for bed. Also consider the schedules of everyone in the household; is there a time during the day when the house is unoccupied for four hours or more? If so, it makes sense to adjust the temperature during those periods. The location of your thermostat can affect its performance and efficiency. 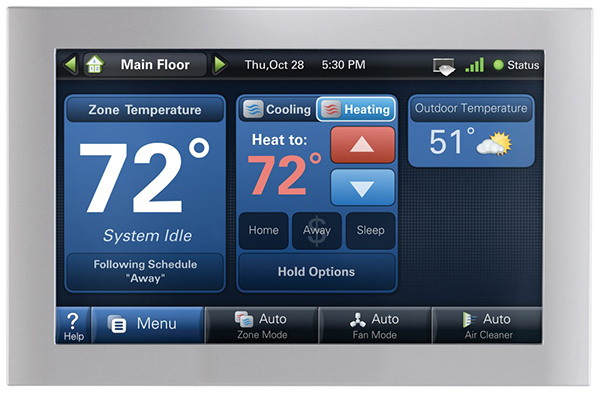 Place thermostats away from direct sunlight, drafts, doorways, skylights, and windows as it can affect its performance. Make sure to read the manufacturer’s installation instructions to prevent unnecessary furnace or air conditioner cycling. Programmable thermostats are generally not recommended for houses with heat pumps, electric resistance heating, steam heat and radiant floor heating. In its cooling mode, a heat pump operates like an air conditioner, so turning up the thermostat (either manually or with a programmable thermostat) will save energy and money. But when a heat pump is in its heating mode, setting back its thermostat can cause the unit to operate inefficiently, thereby canceling out any savings achieved by lowering the temperature setting. Maintaining a moderate setting is the most cost-effective practice. Recently some companies started to sell programmable thermostats designed for heat pump, however ensure to consult a professional when choosing one for your house.